CCC Admit card 2019: Course on Computer Concepts (CCC) admit card are currently available for March exam on the official website. Candidates who have registered for CCC March 2019 examination can download their NIELIT CCC hall tickets from official student portal of NIELIT. 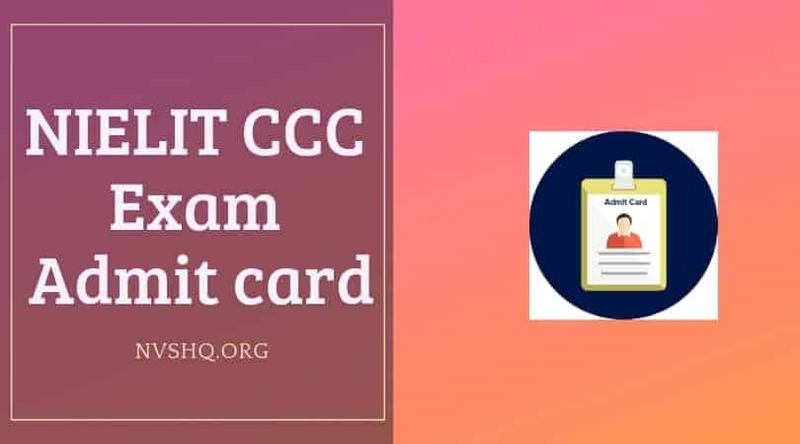 Direct link to download CCC admit card 2019 is provided below. CCC is an IT Literacy Program for developing the basic IT knowledge of the common man. It is a programs run by an Autonomous Scientific Society called as National Institute of Electronics & Information Technology (NIELIT). It was formerly known as DOEACC Society. 2 How to download NIELIT CCC March exam admit card? CCC examination is conducted every month and a large number of candidates take part in the examination, qualify it and get a CCC certificate. CCC march exam is scheduled to be conducted from 9th March to 15th March 2019. For more information about CCC admit card 2019, reader can scroll down. CCC admit card for March examination is currently available. Those who have fill their application form successfully and have made the successful payment of examination fee can download their admit card from the official portal. Candidates have to keep a copy of application form with them at the time of printing the admit card so that they can refer the form for entering the login credentials such as application no., course, etc. This will help them to smoothly download the admit card without any hassle. Information that will be mentioned on the admit card will be based on the information provided by applicants in the application form. Candidates cannot apply for correction of any detail as no request in this regard will be entertained. It is compulsory for all the candidates to produce their admit cards at the examination center for verification on the day of exam. Candidates failing to do so will not be permitted to enter the exam hall under any of the circumstances. How to download NIELIT CCC March exam admit card? Candidates have to visit the official CCC student portal i.e. https://student.nielit.gov.in/. Now, they have to click on the “download admit card” link. They have to select “Course on Computer Concepts (CCC)” option provided under the head IT Literacy program. Candidates have to select the examination year, examination name and have to enter application No., date of birth as per the format, and captcha code. Click on “View” result. Admit card will appear on screen and candidates have to check all the details mentioned on it. Once candidates have check the examination schedule and venue, they have to download and take printout of the admit card. They are advised to take multiple printouts so that candidates have a backup in case one get misplaced or damaged. Venue of examination with complete address. The details mentioned on admit card will be according to the information furnished by the candidates in the CCC Online Examination Application Forms (OEAF). Hence, no request for correction in admit card details will be accepted. As it is known, admit is an important document from the point of view of examination. Each candidate is compulsorily required to carry his/her hall ticket to the examination center on a positive note. No candidate will be given permission to enter the exam hall without having a valid copy of CCC admit card. Candidates also have to carry a valid ID proof to the exam center along with hall ticket. CCC examinees have to bring any of the following photo Identity proofs to the examination center- Aadhar card/ Voter Id/Pan Card/ driving license/passport/ id card issued from government/ Student ID card/ bank passbook/ id card issued form gazetted officer/Tehsil or credit card. Candidates will be given permission to enter the examination center only if they carry a valid admit card and an ID proof along with them. As CCC examination is an online exam, candidates do not have to carry any unnecessary stationery with them. For more information about necessary and restricted items, examinees can go through the guidelines provided by the conducting authority. Admit card can be downloaded from official website. Candidates are advised to be ready with all the login details with them at the time of downloading the admit card. Admit card is issued only to the registered candidates who have registered successfully. Without admit card and a valid ID card, no candidate will be given a chance to enter the exam hall. No request for change in admit card details will be accepted under any circumstances. Or you can contact us to download the NIELIT CCC admit card through comment section below.